Caroline Glick, candidate with the New Right, discusses future of Judea and Samaria and Israel's relationship with the Trump administration. Journalist Caroline Glick, who was recently tapped to run with Naftali Bennett’s New Right, spoke at the joint Arutz Sheva – National Council of Young Israel pre-election conference Tuesday evening to discuss her decision to run for the Knesset, the implications of the Trump administration’s upcoming Middle East peace plan, and the future of Judea and Samaria. 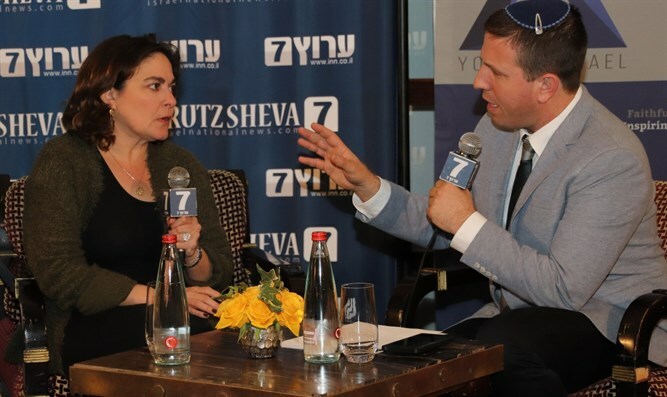 American-born Glick, who has worked at a number of American and Israeli outlets including The Jerusalem Post, Breitbart, and Makor Rishon, explained her decision to make the jump from journalism to politics, telling Arutz Sheva. Chief among the issues on the agenda for the 35th government of Israel, set to be formed following this April’s election, will be Israel’s response to the upcoming Middle East peace plan, which the Trump administration is expected to release after the 21st Knesset is voted in. Glick noted Trump’s “credibility” with Israel, built over the past two years through a series of policy changes including the relocation of the US embassy to Jerusalem, but emphasized that Israel must remain adamant regarding its control of not just the capital city, but also Area C of Judea and Samaria. Since the 1990s, Judea and Samaria has been under divided control, with the Palestinian Authority receiving civil and security control over Area A, and civil control over Area B, while the Israeli military retains full control over Area C, which makes up roughly 60% of Judea and Samaria. Regarding the future of Judea and Samaria, Glick called for the application of Israeli law to Area C, while allowing the Palestinian Authority to remain intact in Areas A and B.